According to ESPN, Hans Smith wrote to Sony’s game studio in San Diego, the title’s developer, a few years ago to talk about his love for baseball and the video game. 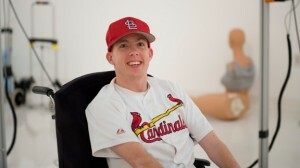 The letter provoked the studio to include Smith as a playable character in MLB ‘10: The Show, and his nonstop ties with the development team spurred it to produce a new game mode in its impending release that makes it simpler for gamers with disabilities to play. According to ESPN, the new mode is named after Smith’s organization, the Association for Disabled Virtual Athletes. Typically the game requires gamers to press several different buttons to control their players, however the new mode offers single-press functionality for everything from throwing a runner out to batting. The game’s AI takes care of running after the ball and other activities that might require multiple buttons.. Baseball games have traditionally featured more sophisticated controls, requiring users to interact with several buttons at a time to perform actions which is why the new mode in MLB ’11: The show is such a commendable addition. With the new mode in place, those who might otherwise have not been able to manage those controls will have the ability to enjoy the game. “This levels the playing field for people who are otherwise outside the sports arena,” Smith told ESPN. Sony’s MLB 11: The Show is scheduled to be released in March on the PlayStation 3. Jenny is originally from Portage, MI and moved to Chicago two years ago to get her Master's Degree in Clinical Exercise Physiology. She doesn't just like studying about exercise, she loves being physically active and being outside.